It will take months to reopen Brussels airport fully, its CEO has warned, as staff return to the site a week after it was targeted by Islamist bombers. Arnaud Feist said the building will have to be rebuilt "from the air conditioning to the check-in desks". The airport said later it would remain closed on Wednesday, dashing hopes it would resume partial services. Thirty-two people were killed and 96 more are still in hospital after bombs targeted the airport and a metro train. EU institutions reopened on Tuesday, amid beefed-up security measures. Increased searches on bags and vehicles are being introduced at the European Parliament while many events organised by non-EU bodies have been suspended. Some 800 airport workers were asked to return to work on Monday to test provisional arrangements involving a temporary check-in area. Enhanced security measures are being introduced in the temporary building and further screening of baggage will take place before passengers reach the departure lounge. The airport will only be allowed to reopen if the government gives the green light, with an initial target of 800 to 1,000 passengers per hour as opposed to the airport's average of 5,000. 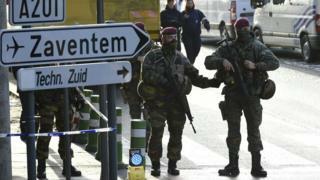 "The provisional structure will not be able to absorb the usual number we had before the attacks," Mr Feist told Belgian media. "Although the structure of the building is intact, it will all have to be rebuilt, from the air conditioning to the check-in desks. And that will take months," he predicted. He said he hoped that the airport would open at 20% capacity on Wednesday, but a later tweet from airport authorities said it would remain closed. Police resumed their hunt for one of the three men who blew up the airport on Sunday, after they released a man named by Belgian media as Faycal Cheffou for lack of evidence. He had wrongly been suspected of being the man pictured by CCTV, wearing a hat and a light jacket. However he still faces allegations of "terrorist assassination". The federal prosecutor said "clues that led to his arrest were not substantiated by the ongoing inquiry". Four people have died in hospital since the attacks, which were claimed by the jihadist Islamic State group (IS). Some 94 people are still being treated in hospital, many in intensive care. Brussels Mayor Yvan Mayeur has acknowledged that mistakes have been made by Belgian investigators before and since the 22 March attacks. Mr Mayeur, who has travelled to Paris to address the city council on the Brussels bombings as well as last November's Paris attacks, told French radio that he thought it was a mistake to free Faycal Cheffou, arguing that the suspect had actively tried to recruit refugees for jihad in a park in Brussels. Asked why so many Islamists had come from Brussels, and from the Molenbeek area in particular, the mayor said that Paris had similar problems. "How can our society have produced children born on our territory who turn against our society?" he asked.